This evening I finished Andreas Kostenberger’s God, Marriage, and Family. It was a book I recommended to my congregation from the pulpit a few weeks ago and I try as much as I’m able to only do that with books I’ve actually perused myself. I’m glad I both recommended and read because Kostenberger’s work is a biblically well-rounded piece on marriage, family and the pertinent issues surrounding them. It also has a section devoted to additional study resources, a discussion guide and answers to that very guide. While not having the current literary characteristic of defending a position by shallow slogan-crafting or anecdotes full of pathos without a point, I deeply appreciated the author’s interaction with the divergent views and interpretations which so often are at the heart of the matter for today’s ethical and biblical struggle with culture. Time after time Kostenberger takes a refreshingly ad fontes approach to issues such as divorce, remarriage, and homosexuality by continually looking at the Scriptural testimony. 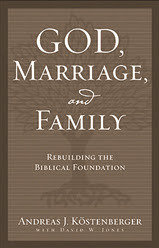 It is for that primary reason I believe this book would be good for small groups who wanted to build a biblical foundation for marriage and family. While some, looking for a book aiming to move them emotionally, might pass on GM&F due to its rather forthright and detailed exegesis and studied theological approach, I believe it is exactly those critical qualities that make it such a sterling choice for reading…and recommendation.